Competition & Performing Line Updates! I hope your weekend was great! It's recital week! We are excited to see everyone on stage and in the Holiday spirit! *Practice your choreography this week so you know it on stage! Studio spirit week - It's STUDIO SPIRIT WEEK! Wear your orange and teal! Ballet class dress code is still black leo, pink tights, and hair in bun, but feel free to wear a fun hair accessory! On your non-ballet days wear your studio colors! Production make up day 12/15- We are renting the STAGE AT FOREST LAKE HS for this make up practice. We will practice 9AM-11:50 (Kaylee needs to be back at the studio at noon). This will give us a chance to run production in a larger space, and also to run other dances as well. Studio sleepover-Saturday, 1/12-Sunday, 1/13. Sign up HERE (payment will not come out until January). It's a super fun night!! Games, junk food, movies, dancing, and more! 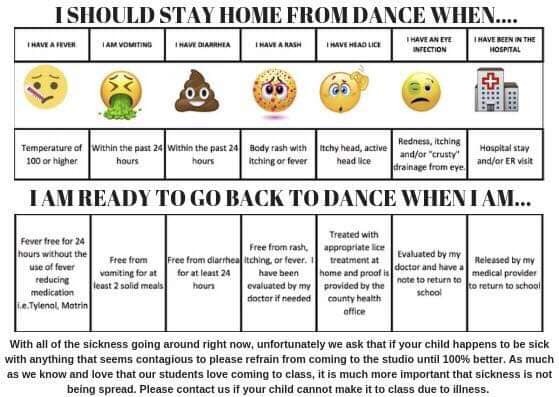 Illness policy - Attachment: 46412241_10156041202808240_1160966828755779584_n.jpg (43.8kB) - We have created a fun new graphic for a guideline for staff and parents for when your child is ill. It is attached! Innovate info-The Starbursts, Crystals, Fusion, Petite Elite, Junior Elite, Senior Elite, Company, Lightning, and Angels teams will participate in The Innovate Dance Event on 2/3 (Sunday) at the Cowles Center in Minneapolis. 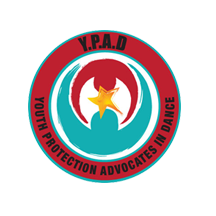 This is an ALL-DAY DANCE EVENT. Students will take 2 classes, perform their routines for evaluation (no costumes), listen to a wonderful motivational speaker, and do a community service project. The event will begin at 9AM and run until approximately 5PM. Parents are welcome to attend the final showcase at around 4:30. More specific info will be given out before the event. Friday, 2/1 is Innovate solo, duet, trio night. We are FULL for this event. I will let you know if more spots open up. This event runs from 5-9PM. Solo evaluation with Miss Lauren - 12/27. Miss Lauren Baker is available for solo evaluations/private lessons on 12/27. If you want a different set of eyes on your child's solo, this is a wonderful option! Lauren is a former DF teacher. Newer PostCompetition & Performing Line Updates! Older PostCompetition & Performing Line Updates!